Preparing our Year 3 children to receive the Sacraments of Reconciliation and First Holy Communion is the joint responsibility of all members of staff, Father Anton (our Parish Priest), Brother David, the Year 3 teaching team and the RE Leader. We have very strong links with our parish community and this is vital to the successful running of our First Holy Communion programme. Photographs of the children are displayed in church so that members of the parish know who they are praying for. 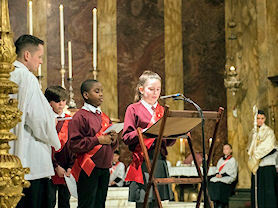 Although the children are prepared in Year 3, we build on the knowledge and understanding gained in the earlier years as well as the child's faith from home. 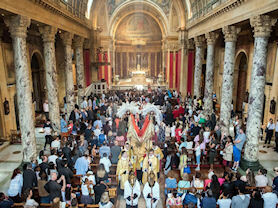 The programme begins in the Spring Term when the children participate in an Enrolment Mass at the Oratory Church. This enables our children and their families to make a clear symbol of commitment and dedication to the programme. The children take part in RE lessons focusing on both sacraments and also preparation Masses leading up to receiving the sacraments of Reconciliation and the Eucharist. As well as RE lessons and preparation Masses, the children (along with a family member) attend a whole day Spiritual Retreat day. 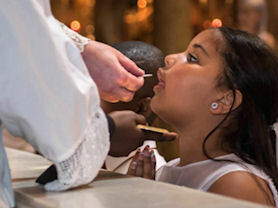 This retreat day forms part of the Oratory’s 'Journey of Faith' Programme which prepares the children and their family in receiving the Sacraments. The children receive the sacrament of Reconciliation in May and the sacrament of the Eucharist in June. 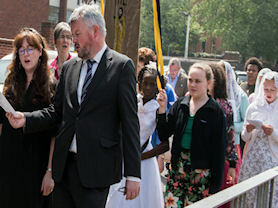 Reconciliation is a special occasion whereby children are supported by both staff and parents. 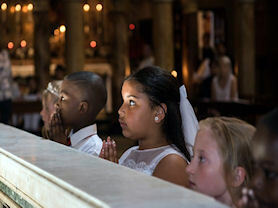 Those accompanying the children at this Sacrament also take part in the celebration and are given the opportunity to receive reconciliation themselves. 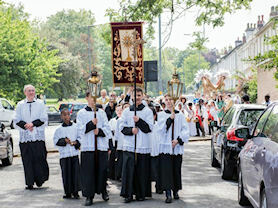 On the day of First Holy Communion the school and parish support our children and families by preparing and taking part in this special Mass which is followed by everyone taking part in the parish’s annual Corpus Christi Day Procession to our School followed by open air Benediction. 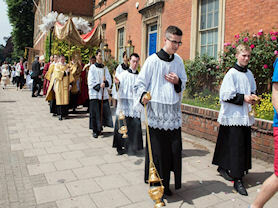 It is a powerful visual reminder of the strong partnerships we have with home, parish and the local community as we walk, pray and sing together in a public act of devotion to the Blessed Sacrament. 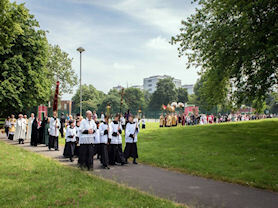 One of the ways in which we make the procession special is by engaging the services of a professional brass band. 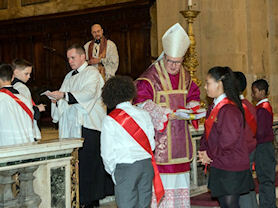 Following the receiving of the Eucharist, our children prepare and lead the Thanksgiving Mass held in school. 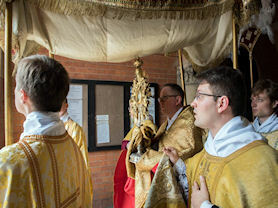 They partake in all parts of the liturgy. Afterwards they are given the opportunity to celebrate with their families and friends with a party and photographs. 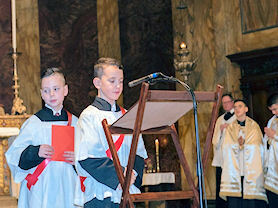 During their final year at the Oratory, the children are prepared for and receive the Sacrament of Confirmation. This begins with a meeting for parents and carers with the Headteacher, Father Anton, the Year 6 teacher, and the RE Leader from school where they are given the opportunity to find out more about the sacrament itself and then to discuss the programme which their children will follow. 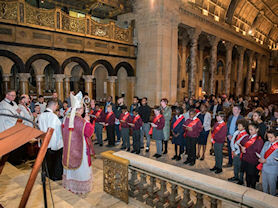 This is followed by an Enrolment Mass at the Oratory Church prepared and led by the children along with the parish community. This enables our children and their families to make a clear symbol of commitment and dedication to the programme. Photographs of the children are displayed in church so that members of the parish know who they are praying for. The children are prepared following a school based programme and have a weekly lesson. 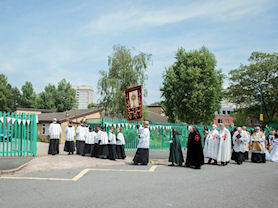 The programme is based on the Curriculum Strategy used in the Archdiocese of Birmingham. As part of their work, children prepare a project on the saint of their choice. They are encouraged to select the name of a saint who has inspired them in some way. A sponsor is also chosen and has the role of supporting the child in their spiritual life. 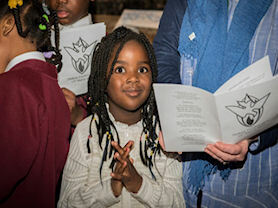 During this time the children have the opportunity of a three day spiritual retreat at Alton Castle which enriches and deepens the understanding of their faith. Our children spend time with Father Anton and Bishop Byrne ensuring that they are fully prepared and ready to receive the sacrament. 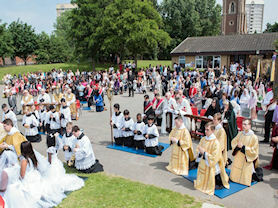 The evening itself is a great celebration with children, parents, carers, clergy, staff and members of the parish.